Out of the world War came a matter of great spiritual significance — the establishment of a Homeland for the Jewish people, recognized as such by the public law of the world. In the realization of this aim the United States played a leading role. I know how close it was to the wish of President Wilson. The formal terms of its expression during the War, the so-called Balfour Declaration, had his personal approval, and he did much to have it written into the peace treaty. 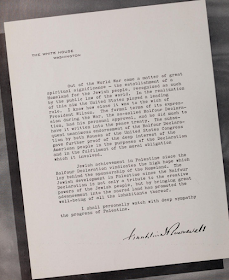 The subsequent unanimous endorsement or the Balfour Declaration by both Houses of the United States Congress gave further proof of the deep interest or the American people in the purposes of the Declaration and in the fulfilment the moral obligation which it involved. Jewish achievement in Palestine since the Balfour Declaration vindicates the high hope which lay behind the sponsorship of the Homeland. The Jewish development in Palestine since the Balfour Declaration is not only a tribute to the creative powers of the Jewish people, but by bringing great advancement into the sacred Land has promoted the well-being of all the inhabitants thereof. I shall personally watch with deep sympathy the progress of Palestine. It looks like most of this letter was actually written in 1932, with the last paragraph perhaps added for the exhibition. 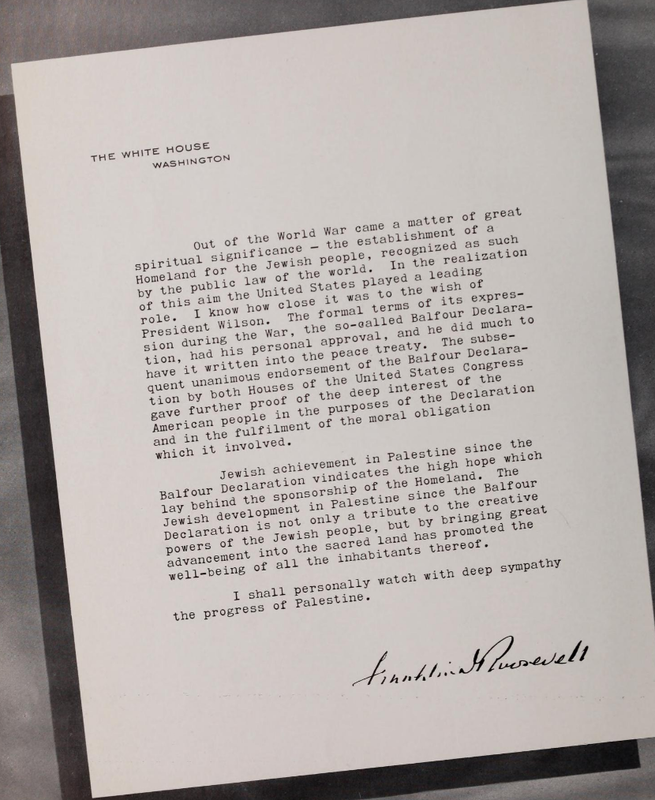 In this letter, FDR confirms that the building of a Jewish homeland in Palestine was enshrined in international law. This means building through the entire area of the British Mandate. Has the status of the land changed since then? The areas illegally seized by Jordan in 1948, now known as the "West Bank," did not change their status since Jordan's annexation was not recognized by the international community. In 1967, when Israel gained those lands back, nothing changed from the San Remo conference and other nations' recognition of all of British Mandate Palestine as being the area where the Jewish homeland should be built - which of course includes towns and villages. The first change to the status of those territories came during the Oslo process when Israel apparently gave Area A to the PLO. The areas where Jews have moved to live are still fully within the areas covered by San Remo and international law since the early 1920s.